The two businesses could not be more different. One company (Honeywell) is a multi-national, publicly traded Fortune 100 conglomerate that produces an array of products, serving a wide variety of industries and employing over 130,000 people around the world. The other (Kloke Group) is a small, privately held, local and interstate moving and storage company with revenues under $20 million and approximately 150 employees and contractors. But Greg Herceg, consultant for Warren Whitney and former Honeywell exec and Kloke Group CEO, says these two dissimilar businesses offered him very similar leadership lessons during his time at each. While he was at Honeywell, Herceg led an $84,000,000, 250-person global business unit. 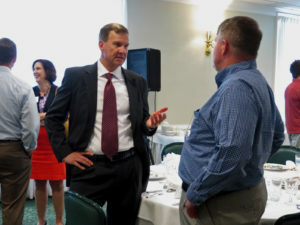 He then moved on to Kloke Group, where he increased the company’s total revenue by over 30 percent and diversified its revenue base, among other accomplishments. Herceg candidly described his trials, tribulations, successes and challenges in a recent Knowledge Network presentation. He shared what he’s learned about motivating employees, hiring outside resources, maintaining financial dashboards, strategic planning and much more. Like many CEOs, his biggest challenges involved employee management. “I wish I had paid a lot more attention to my HR-related classes than to the heavy finance classes [at Darden School of Business], because that’s what I spent most of my time on at both companies – HR-related issues,” said Herceg. “The most important lesson I’ve learned in leadership is to build a strong team around you through developing deep, trusting relationships and by understanding how to uniquely motivate each person. A close second to that is to leverage your internal resources in order to grow by collaborating and partnering with those outside of your organization,” says Herceg. 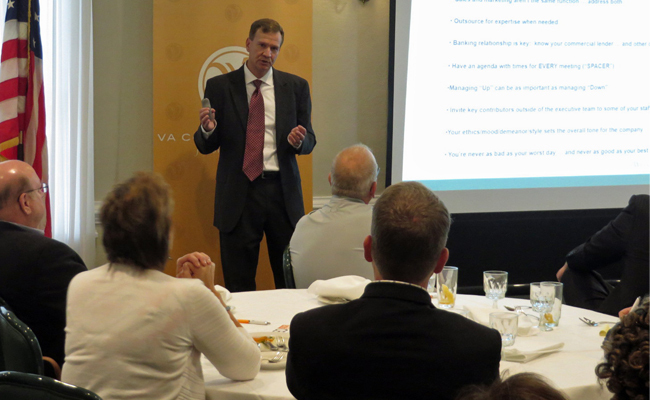 Here are a few more takeaways from his presentation to VACEOs membership. In regards to #5: We couldn’t have said it better ourselves. Thanks for sharing your experience, Greg! This moment courtesy of “Lessons from the Trenches.” Greg Herceg, former VACEOs forum member, currently a director at Warren Whitney.